Healthy ground turkey kefta recipe with honey glazed carrots & herby couscous salad. Healthy Meal Prep Recipes means cutting out the junk from your diet and adding wholesome food to your diet. You simply prep your recipes over the weekend, refrigerate them or freeze them to enjoy over the entire week. 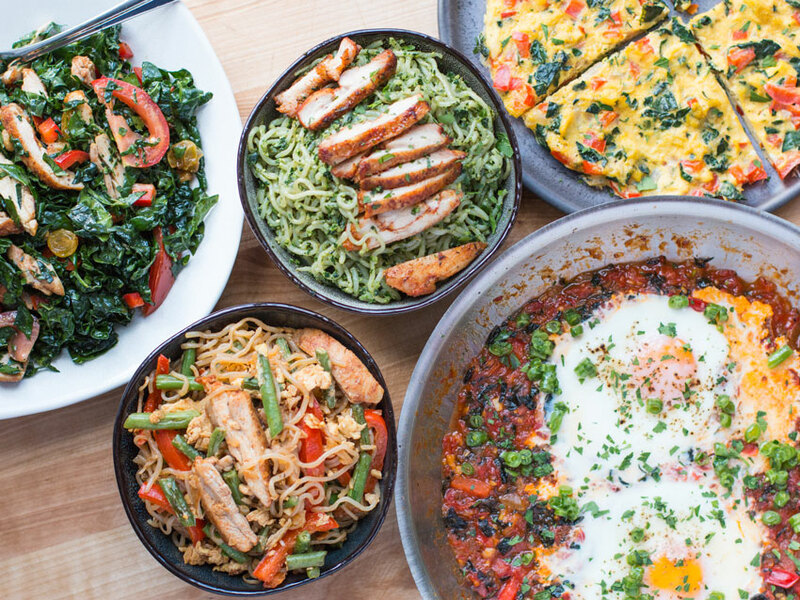 Meaning, you don’t have to waste time creating healthy recipes after a tiring, busy day. It also means you won’t have to order in junk because you don’t have the energy to give your ‘A’ game in the kitchen. 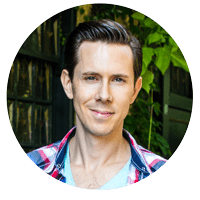 There’re tons of healthy meal prep recipes on the internet, so what’s great about my meal prep recipe? I up the flavor meter in all my recipes. My healthy meal prep recipes aren’t just crazy healthy; they are also delicious and also so easy to create. 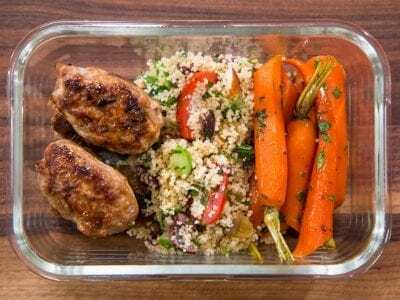 In this meal prep recipe, I’m making Turkey Kafta kababs, pan-roasted glazed carrots with couscous salad. So, if you’re ready to impress the girls with some seriously healthy meal prep recipes, then you gotta try this one! If Meal Prep’s your thing, then subscribe to my YouTube channel. We also do live healthy meal prep recipes including some ground turkey recipes every Friday on my Facebook Page. 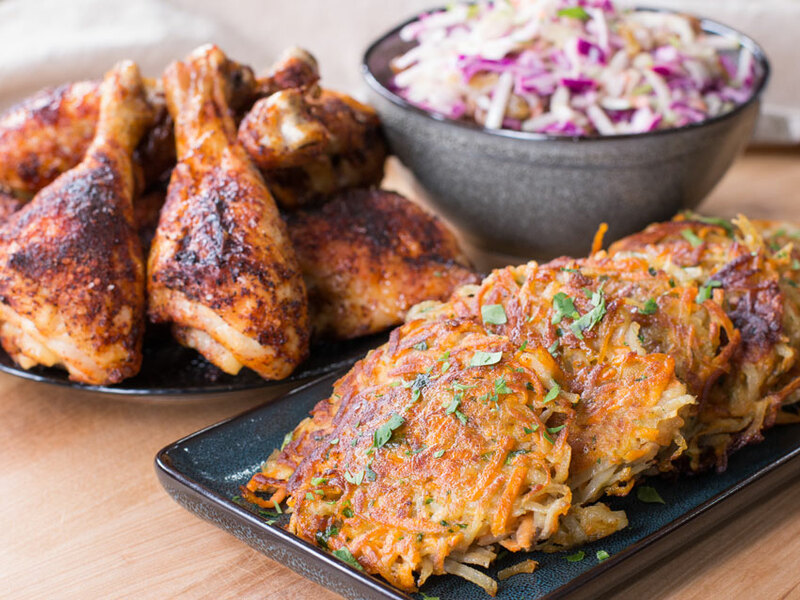 The good thing about turkey is that it’s more flavorful than chicken. For my ground turkey recipes, I prefer to your ground turkey thigh. Because again, flavor! You can also use ground breast turkey or ground chicken breast in this recipe. 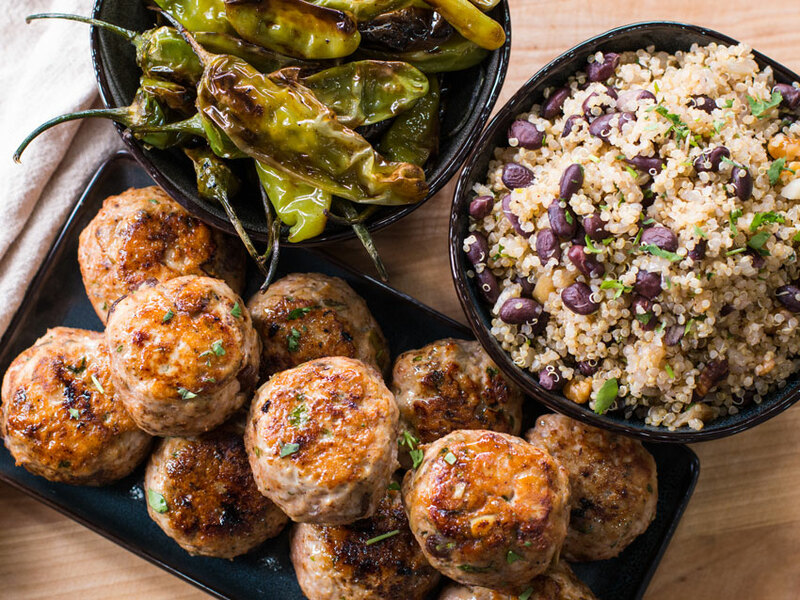 This is one of the best healthy ground turkey recipes out there right now! I’m not saying this because it’s my recipe. But this recipe won us $18,000 at Guy’s Grocery Games on the Food Network. The kafta kababs are pretty easy to make. Dump in the ingredients to your bowl of ground turkey. And mix it all up. Next, wet your hands and start making your kababs. Wetting your hands prevents the kababs from clinging to your hands and creating a mess for you. Finish them by frying them in a cast-iron pan in two batches. Bored with Chicken or another Turkey Lover? You can also check out my other ground turkey recipes: Turkey Meatloaf Meal Prep and the Low Fat Turkey Burger. My glazed carrots and couscous salad both, in this healthy meal prep recipe, have a bit of a sour and sweet taste. For glazed carrots, you can either use full-sized carrots or the frozen mini-carrots. Totally depends on what you like and what’s easily available to you. Couscous salad is also easy to prepare. You can easily create the entire salad in one bowl! I started off the couscous by adding boiling water to the couscous in the dish with some salt. Next, I covered it up with a lid and left it for seven minutes. The water cooked the couscous, leaving behind a fluffy couscous. The rest is easy. Add in the rest of the ingredients and enjoy your glazed carrots with couscous salad and ground turkey kababs. Add the couscous to a medium size mixing bowl and season with ½ teaspoon of salt and a couple cracks of pepper. Bring 1 cup of water to a boil and pour it over the couscous. Give it a good stir and immediately cover the bowl with plastic wrap or tin foil. While the couscous is soaking for 7 minutes, prep the rest of the ingredients for the salad. Remove the plastic wrap and use a fork to thoroughly fluff the couscous. Add the almonds, next 8 ingredients, ¼ teaspoon of salt, a couple cracks of pepper, and 2 tablespoons of olive oil. Mix well and check for seasoning, it may need some more lemon juice. Set aside. Add the ground turkey to a large mixing bowl along with the cumin, next 6 ingredients, 2 teaspoons of salt, and a few cracks of pepper. Mix very well using your hands. Wet your hands slightly and form the mixture into small kebabs that are about 2 inches long and one inch wide, place them on a platter or tray. Once all the kebabs are formed, pre-heat a large pan, preferably cast iron, over medium heat for 2 minutes with 2 teaspoons of olive oil. Cook the kebabs for 5 minutes on the first side, you may need a spatula to help loosen them when you go to flip, and cook for another 5 minutes on the other side. Don’t overcrowd the pan, work in batches, that way the kebabs will get nice and crusty. For the carrots, use the same pan you just cooked the kebabs in, add 2 teaspoons of oil and set the pan over medium heat. Add the smashed garlic, thyme, and cook for 30 seconds. Add the orange juice, next 3 ingredients, and stir so the honey melts. Add the carrots to the pan along with ½ teaspoon of salt and a couple cracks of pepper, mix well so the carrots are coated in the honey mixture. Cook uncovered for 10-12 minutes until the orange juice has evaporated and the honey starts to caramelize, making sure not to burn the honey. If the pans runs out of liquid and the carrots are not cooked through yet, add a splash more orange juice. Turn the heat off and add the parsley, mix and set aside. 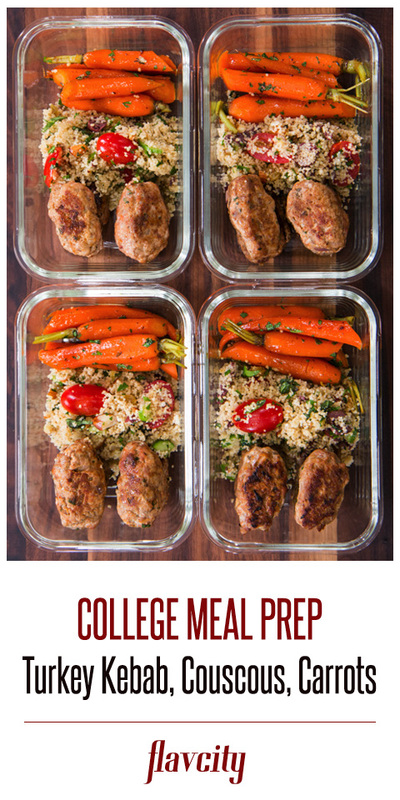 Arrange your meal containers with a few of the kebabs, some couscous, and some carrots, enjoy! Everything will keep in the fridge for 5 days and the kebabs and carrots can be frozen for 2-3 months. When time to re-heat, wrap the container in foil and place in a 400 F oven for 10-12 minutes. 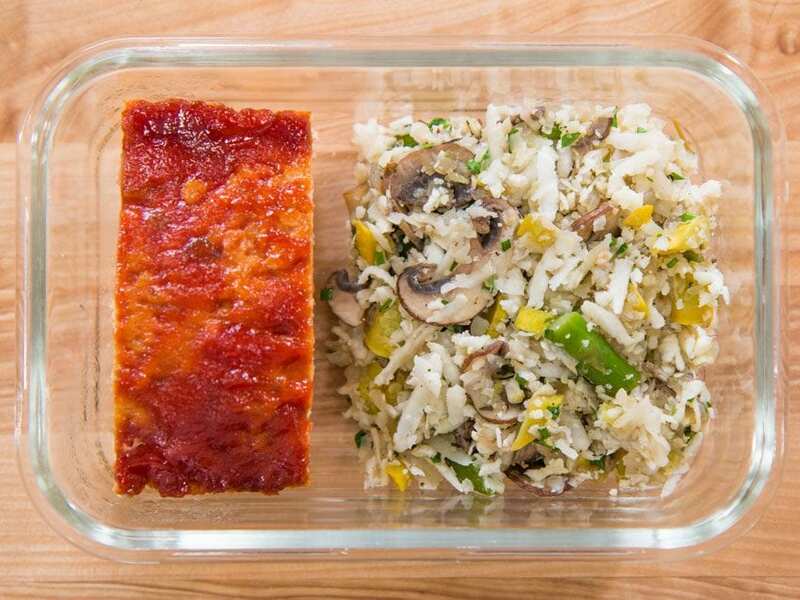 If using the microwave, cover the container with a wet paper towel. I wanted tto write a little comment to support you. This recipe is not gluten free (as listed) if you are using couscous, which is made from durum wheat. Perhaps quinoa may be a better alternative for individuals needing gluten free menu choices. Hi Julie, thanks for catching that! You are correct, couscous is not gluten free. I’ve updated the category for this recipe. Thank you for the note! i dont see it as listed as gluten free julie!? but quinoa would be the best gf option. thanks! love your recipes , especial veggies, you are awesome . Thank you so much! Keep on cookin’!